The Rossignol Diva is a very well-rounded mountain freestyle board for the girl that sees harder snow, keeps it centered all the time and likes to ride switch almost as much as they do regular. It’s been a board that our crew has really enjoyed over the years. The 2018 and 2019 Rossignol Divas have a centered stance so it has less directional float than before but it rides better switch. Flex/Buttering: Its a medium stiff boardering on stiff flex, so it’s not supper butterable. On Snow Feel: It’s s stable ride that can handle just about anything. Edge Hold: It comes with Rossi’s serrated edge (5s) which gives it great edge hold for even crazy ice situations but it’s not grabby like some boards with super traction tech get. The Diva smoothly holds it’s edge but when it’s time to turn it lets go just as easy which was awesome. Turning Experience: Great fun turning this board in any situation it does exactly what you tell it to. Carving: Very fun and easy to carve, and you get the spring out of the turns as well from the camber part of the profile. Speed: It’s a fast and stable deck and has the 7500 sintered base which means it should stay fast for a long time. Uneven Terrain: Rides great in choppy uneven snow, turns quick for moguls and bumps but is stiff enough that it can charge through chunder as well. Powder: Normal for twin but does have rocker on the tip and tail to help you out. Jumps: Feels super solid on jumps with great pop and stability. Jibbing: Normal at jibbing but wouldn’t be my specific jib board. Pipe: Great pipe ride, stable with great edge hold, super fun board in the pipe. The 2018 Rossignol Diva has the same shape and tech but centered the stance making it easier to center for mountain freestyle riding but not as good when it comes to directional float in powder. So get the 17 or below if you want a more versatile all mountain board and get the 18 if you want a better all mountain freestyle ride. 2017 Rossignol Diva Snowboard Review. So The 2015 Rossignol Diva has a few changes. 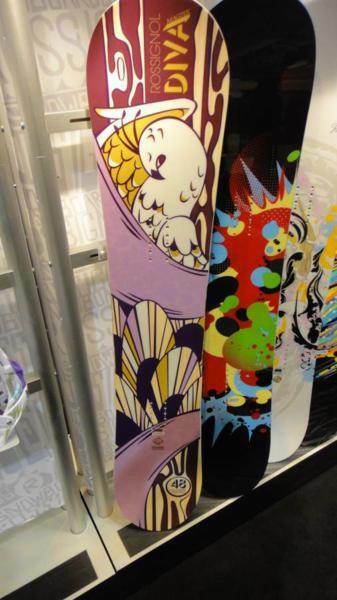 It’s got a more mellow mtx design that has less grab in soft snow and a little bit of a blunt in the tip/tail. On Snow Feel: What we like about the Diva is it’s ability to remain consistent in almost every type of snow. It’s always the same stable ride in icy conditions or soft conditions and everything in between. This is the intangible quality that makes this board a favorite. Also it’s pretty good at everything like a good all mountain board should be. Let’s face it. All Mountaiin boards are all about compromising and this board compromises without taking the fun away from riding. It’s pretty aggressive though and almost all the girls that have ridden it feel like it’s not catchy but at the same time the edges feel really locked in. It sit’s more on the aggressive side of all mountain. Turn Initiation: The Diva turns pretty easy for those that know how to turn a board correctly. If you size this right for your feet then it will turn pretty quick and have some snappy response. If you size up it will be a little slower edge to edge. Flex: Pretty medium/stiff flex that’s good edge to edge. Edge Hold: Edge hold stepped down a bit but it’s still got amazing grip. They just toned it down more near the tip/tail so it still grips almost as well as it use to on ice but now doesn’t grab as much as it use to on softer snow which is a nice bonus. It makes it more doable for those that see ice to soft snow where before it was more for ice to medium snow. Now you can ride it without much difference in feel in all conditions. Powder: There was a little improvement in powder with the slightly blunted nose and the more mellow mtx. It’s got an easy float. Carving: Now there isn’t much compromise here when it comes to carving. It really holds an amazing edge but also has a nice spring out of the turn. If you really like to lay into a really hard carving turn you have a friend with the Diva. Speed: It’s not like many freeride bomber boards but it’s got more than enough wide open mountain speed to make most riders happy. The base also keeps it’s speed pretty well if it’s waxed. Uneven Terrain: If you size this right for your foot it’s great from first to last chair but if you go a little big it can be a little sluggish between the bumps. Switch: The Diva feels like a directional twin or at the very least a twinish board that when centered rides switch really well. Jumps: Nice but not exceptional pop. It’s got good snap near the tip/tail. Jibbing: Not really a jibber and this is the boards biggest weakness. Yeah hit an easy box or bonk but don’t expect to session the jib park all day. Pipe: Wow what a great pipe board. It’s got everything that most pipe riders like. Exceptional edge hold, stability and drives from wall to wall nicely. The plus side is it’s pretty forgiving too. Not much has changed the last couple of years but it’s still a great board and especially so for the rider who likes icy conditions. 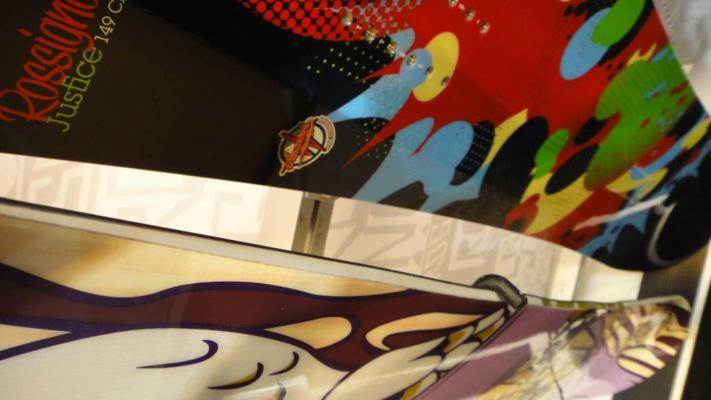 The Rossignol Diva is one of those boards that should probably get a lot more recognition that it does. We found this to be fun for all that rode it. It’s even a bit on the aggressive side. For me the editor it was one of my favorite boards I have tried recently and for the other riders it really surprised them. All of us agreed that this is a solid all conditions all mountain ride. In 2011 The Diva added their hybrid camber tech to the MTX shape and now it has a stable ride as well as a better float in powder. All in all the Diva can do great things throughout the mountain and is reasonably priced. The 2010 is a great board but the 2011 hybrid camber tech is worth it to spend more money on for a better all conditions ride. The 2013 is very similar to the 2012 but just tiny bit better due to some fine tuning. On Snow Feel: The Rossignol Diva has a very stable versatile ride. It’s got a rare ability to allow an intermediate rider to handle it in a mellow way but still entertain an aggressive expert rider. Its a board for many moods and conditions. It’s got more camber between the feet than most Rossignol Amptek boards but there is still a good amount of rocker. The stable but catch free feeling combined with some of the best edge hold we have come across makes this one of the best firm to icy condition boards out there. It loves speed, carving, the pipe and is all right when it comes to jumps. Powder: This is a directional twin with a little bit of a setback so it’s not going to blow your powder mind but the pretty solid rocker after the bindings makes for a good float for a board of this shape. We had a little powder and a really deep deep day. The Diva did a good job staying afloat but it wasn’t effortless. Turn Initiation and Carving– The Diva seems to be a pretty stiff board torsionally. It’s not difficult to turn but it does take a slight bit of work. We still found it very easy to make quick tight turns and even more fun to make bigger wide turns. When it comes to carving the Diva had the ability to carve on snow that you would normally wash out on. In the areas that had good snow we could really lean into a turn. Speed: Very Stable and Damp but it’s not like some of the stiffer boards. The base isn’t super high end tech and it’s not as fast as many of the bases we have experienced but it is right up there with the average board out there. If this had a faster base this might have an excellent rating. Uneven Terrain: It’s not ideal for bumpy terrain but it can hang when you make a wrong turn down a mogul run or have to deal with end of the day crowded snow there are better boards but it’s not going to make you pay for it. Approximate Weight– Pretty light but not a feather weight. Still its well built and not much to feel on your foot when riding the chair. Edge Hold: Right up there with all the great Magnetraction boards. The kind of Hybrid Camber Rossignol has makes for very good edge hold to start with. When you add Magnetraction to this it makes for edge hold that we feel is incredibly grippy. The only time we aren’t supper stoked on the Diva is when the snow is very soft. It’s a common problem with many magnetraction boards. They seem to dig in a little too deep or can be a little too grippy in wet, cruddy or dense soft snow. The Diva is an absolute dream on a hard pack day. Flex: Pretty stiff between the feet but the tip and tail are not as stiff. The torsional stiffness is up there though. It’s not that easy to butter but it’s not terrible. Switch: We found this to be very easy switch. It’s almost like a twin. Jibbing– Not ideal. If you filed down the edges you could slide around ok but it’s not for big technical jibs. Pipe: The Diva just screams pipe. It climbs the pipe wall very well and will hold an edge no matter how icy. It also drives very well from wall to wall and has the feeling that beginner to really accomplished riders should appreciate. Jumps: It’s pretty poppy but not as poppy as some of the boards we have used. You can still generate a good amount of air from this board. Launching off of kickers of small to pretty damn big will work with this board as well. It’s pretty forgiving when it comes to landing too. 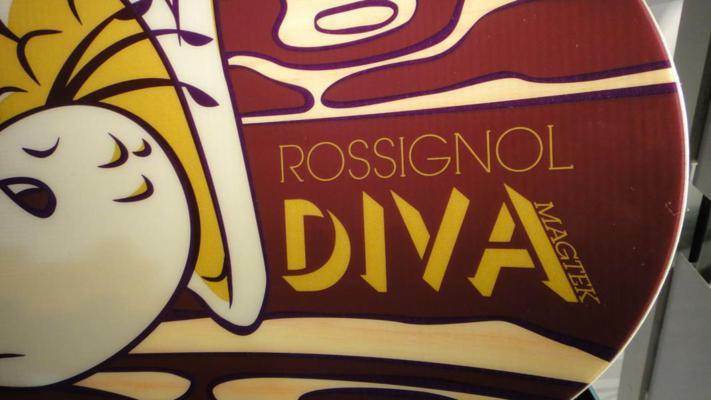 We try to get as many images of the Rossignol Diva, but forgive us if they're not all there. Absolutely love this board! I was looking for a board that was built for speed, which could hold a great edge in even the most icy of conditions. I have not been disappointed in the 2016 Diva. I got a chance to use it this week on both extreme ice, and on fresh powder. While I do think the performance is just a tad better in the former, it was solid throughout the week. A fantastic edge and a serious lack of chatter means that I spent longer on the slopes, and felt less tired at the end of the day. Absolutely zero regrets in going with the 2016 Diva. If you're a big fan of speed and want a board that'll grip around fast turns on icy conditions, the Diva is a great fit!